Updating your bedroom's look with these easy ideas. I hope you like it ,, Enjoy !!! If you keep your bedroom's walls and furniture neutral, it's easy to add bursts of color whenever and wherever you wish. 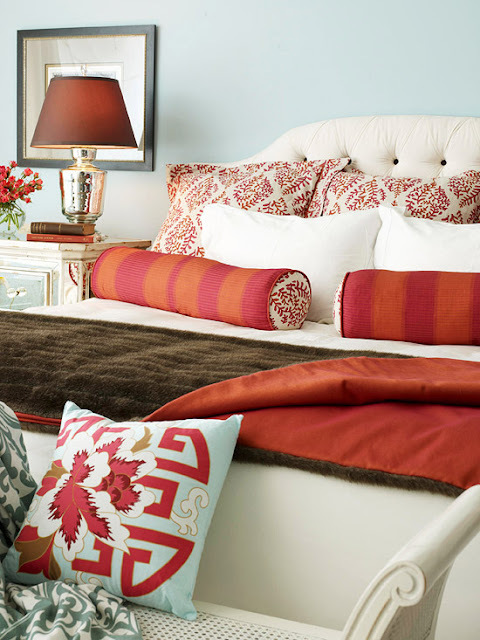 Pick one or two colors you love and then repeat the hues in vibrant artwork, bold bedding, and colorful accents. Touch is a huge part of creating comfort. In a bedroom, texture becomes comfort you can feel. It's easy to alter a bedroom's texture with a change of linens--use a furry throw in winter and cotton throw in summer. Traditional: Hand-tufted rugs, woven wools, tooled silver, cut crystal, gilded frames, silk, china, and polished wood. Country: Braided rugs, worn wood, rusted metals, chenille spreads, ironstone pottery, blown glass, and ticking. Romantic: Velvet, furry throws, crystal prisms, embroidered fabrics, lace, painted furniture, and hand-hooked rugs. Modern: Laminated-plywood furniture, plastic, smooth leather, stainless steel, terrazzo flooring, and teak. Accent pillows let you quickly alter the personality of a room and shift the balance of color. They're especially powerful used in a bedroom because the bed is a natural focal point. Pillows can update a room instantly by adding volume, pattern, texture, color, and personality. Here, a subtle backdrop of cream and blue is brought into intense focus with a collection of lively pillows. Raspberry and sky-blue accent pillows pull the wall color and accent color together perfectly. Bold striped neckroll pillows add variety and interest to the grouping. A dramatic headboard can add instant impact. You'll find a wide variety of new headboards available at all price points, but consider customizing your existing headboard or using an unexpected salvaged piece for a low-cost option. 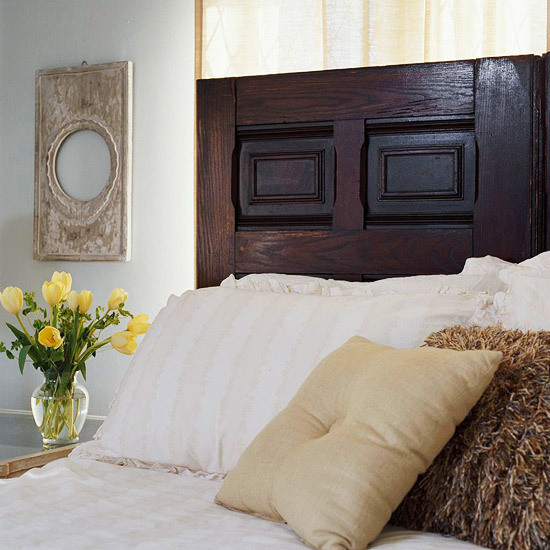 Here, a large salvaged door finds new life as a headboard. Its generous size provides a bonus by blocking light, creating a cozy, private retreat. To set a mood, use draperies and classic swags for a formal look, curtains and shades for an informal look, and simple blinds for contemporary appeal. Consider lining--room-darkening or insulating--that suits the treatment and your needs. General overhead lighting is less important in bedrooms. Instead focus on bedside lamps and other sources of accent lighting to turn a bedroom into an inviting, comforting retreat. And the type of light is important, too--something as simple as replacing an old light bulb with a warm-spectrum fluorescent might provide just the freshness your bedroom needs. Nothing looks and feels fresher than new bedding. If you love the idea of new bedding but are short on storage space for bulky comforters and quilts, consider a duvet, switching out the duvet cover every season. 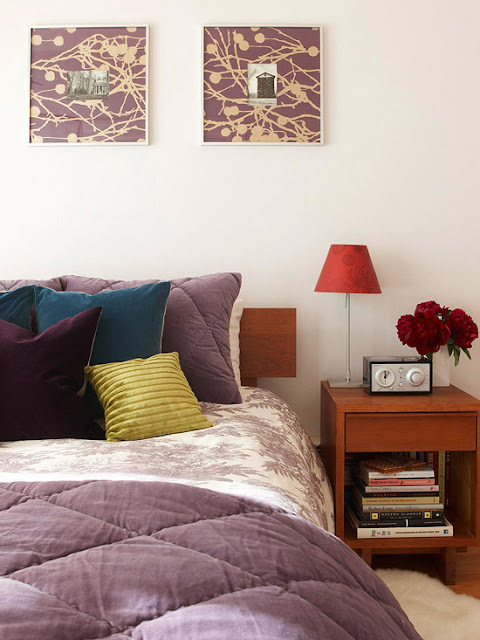 To give your bedroom a decorative lift without spending a dime, angle the bed from a corner. If your present headboard looks too bulky for this arrangement, replace it with a salvaged iron gate or a shorter upholstered panel. Add drama with contrasts. In this chic bedroom, drama is created through size and color. The eye is immediately drawn to the hanging globe fixture. The large size creates instant drama. And the contrast between the rich chocolate-brown walls and white trim and bedspread is made extra striking when paired with a splash of lime green. Here's a quick and easy way to create a cozy feel in your bedroom: Paint the ceiling the same color as your walls. Without a visual break between ceiling and walls, the room feels smaller and more intimate. Here, robin's-egg blue creates a soothing backdrop for a serene, sophisticated retreat. Used in combination or alone, trim, molding, and wainscoting offer nearly endless design options. Depending on the style of the room, the effect may be casual or formal, rustic or defined, traditional or contemporary. But in every case, millwork surface treatments can add charm and texture to a room. In what started as a cookie-cutter bedroom, classic flat-panel wainscoting adds structural appeal to a long expanse of wall. Combined with the light wall color, the effect is subtle yet satisfying. A perfectly matched bedroom--the dresser goes with the bed and the corresponding nightstand, and bedding from the same collection--can become stale if the look is too uniform. 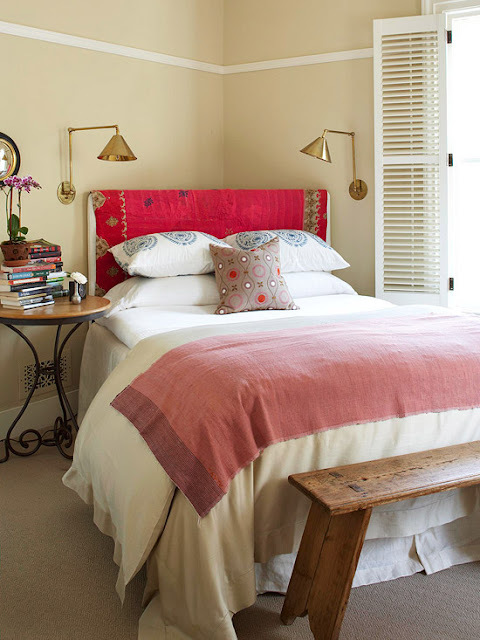 Wake up a tired bedroom with an eclectic blend of fabrics and furnishings. Pattern, like color, exerts an emotional pull that can jumpstart a decorating style. Whether you gravitate toward crisp stripes, bold florals, or classic toile, pattern can be used to liven up a space. Add a dash of pattern to an otherwise patternless room by draping a quilt or duvet across the foot of the bed, as shown here. A bold, geometric pattern creates an instant focal point in the black-and-white room. In many bedrooms, closet doors take up a significant amount of wall space. 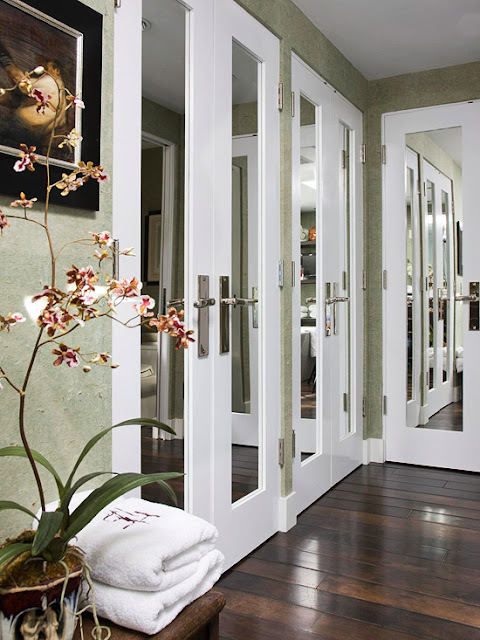 Why not replace the bulky, utilitarian sliding doors with something you'll enjoy waking up to every day? Here, sliding closet doors were replaced with chic French doors. Mirrored panels hide closet clutter and give the room more visual space. 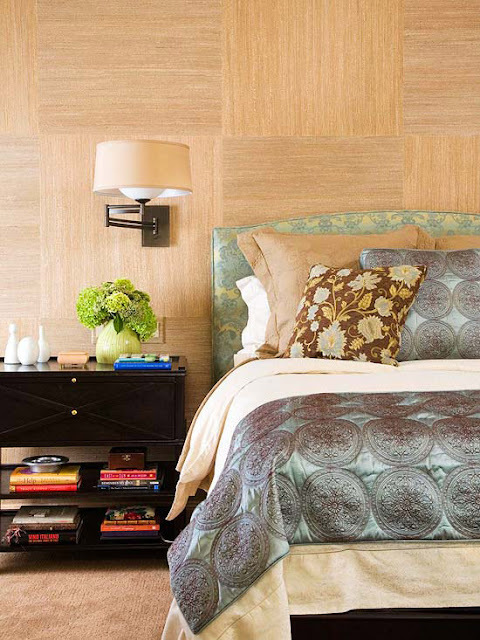 Try paneling a single wall or one section of a wall with a favorite wallpaper. It's a sure-fire way to call attention to a seating area or to add pattern without the expense of papering an entire room.